Warm days in early spring are just delicious. In the Northwoods, it is a rare delight to walk slowly through the warm woods. Fall and winter require a certain amount of movement to keep fingers and toes warm and summer hikes are often chased by mosquitoes. There is one brief period, though—after the sun has strengthened, the wind has mellowed, and chilly nighttime temps are keeping the bugs at bay—when you can saunter comfortably. I was doing just that—and enjoying very much the warm rays on my bare arms—when a little orange and brown flutter caught my eye. Butterfly! I tracked its erratic flight path in the hopes that it would land and let me see it more clearly. 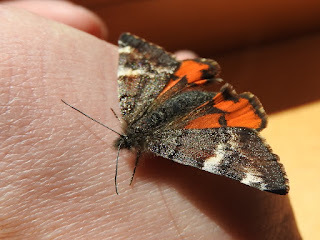 Last year in mid-April I spotted a red admiral butterfly with those same shades of ripe tomato and fresh dirt, and I hoped this might be that old friend. When the blur landed in the middle of the soggy gravel road, though, I could tell it was different. For one, its wingspan was just over an inch. Red admiral wings fan twice that wide. For another, the bright splotches of orange were not displayed boldly across its shoulders like an admiral’s stripes; they were coyly hidden on the hindwings. Then there was the halo of fuzz around its head, and the delicate fringe on all of its trailing edges. Could this bright little day-flier be a moth, I wondered? Creeping forward as it sat resting on the gravel, I kept my shadow out of its space and readied my hands for the catch, while also preparing myself to be disappointed if it got away. I’m not sure which one of us was more surprised by my successful pounce, but I did end up in the possession a delicate sprite. Luckily I’d been on my way home, and had less than a quarter mile of sauntering to go. It was relatively easy to scoot my new friend into the bug bottle sitting on my front windowsill (I’d been meaning to put the jar away for months, but as it turns out, it was in the perfect location), and get a better look. Each forewing was mottled brown with two white bars. The hindwings were mostly orange with black bars and a dark fringe along the edge. 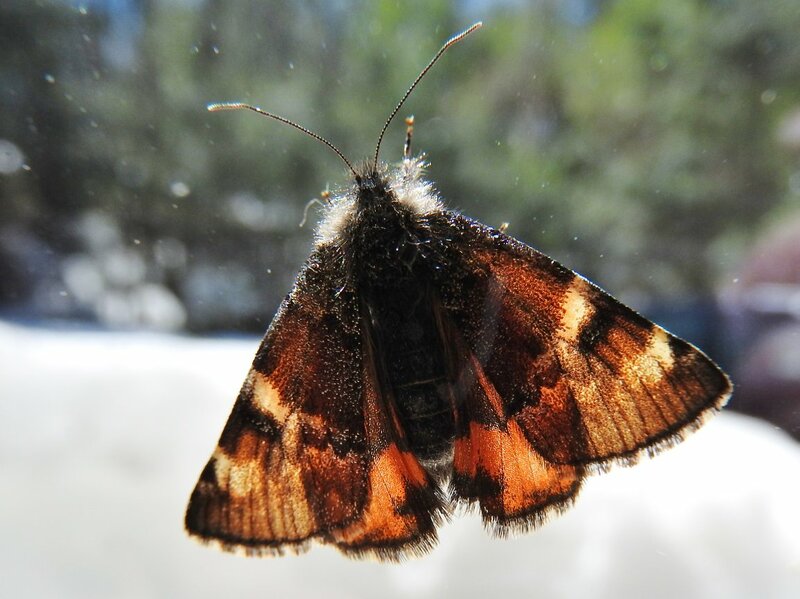 After readying my camera, I set the moth loose to climb up the window. The sun shone through its paper-thin wings. It was luminous. Each tiny scale on its wings sparkled in the warm spring light. After a series of glamour shots I released the moth back outside and worked on discovering its name. Archiearis infans: that is its scientific name; but one entomologist called it “First-born Geometer,” and it’s also known as The Infant. Both names refer to its phenology as one of the first non-hibernating day-flying moths to emerge in the spring. It overwintered as a pupa, and must have finished metamorphosing in the recent warmth. Its adult life will last just a matter of weeks and be very focused on mating and laying eggs. It life cycle starts so early in spring that sometimes the caterpillars emerge before their food plants—birch, alder, poplar and willow—have leafed out. In that case they feed on the flower catkins of those trees instead. While the adult of this moth is a shimmering beauty, its slender, green caterpillars have their own charm. They are inchworms! They measure quite a lot of the earth, too. This family of moths contains more than 23,000 different species worldwide. The First-born Geometer ranges from Newfoundland south to New York, and all the way to Alaska. All the way to Alaska. May 15 is my departure day, when I’ll begin my own journey to measure the earth in words and photos. The logistics of my four-month sabbatical become more daunting each week, so I’ve been drawing inspiration and courage from reading the words of other adventurous women: Chery Strayed’s Brave, Mary Oliver poetry, and An Unspoken Hunger, by Terry Tempest Williams have been on my nightstand. In one chapter, Williams offers words of wisdom given to her for her college graduation: “Don’t worry about what you will do next. If you take one step with all the knowledge you have, there is usually just enough light shining to show you the next step.” That advice came from Mardy Murie—herself an amazing adventurer of the Alaskan frontier. So, as I pack my bags, I’m thinking of both Mardy and the caterpillar. My first step will be home to visit my parents. From there, I’ll gather what light I can find, clasp tight with my hind legs, and reach out. . .
For 50 years, the Cable Natural History Museum has served to connect you to the Northwoods. Come visit us in Cable, WI. Our new exhibit: “Bee Amazed!” is open!